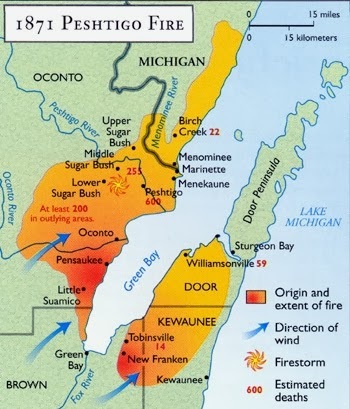 I know that many of you have never heard of the Peshtigo Fire which took place on October 8, 1871, the same day as the Great Chicago Fire. My very first historical, Whispers of Love (in my Blessed Assurance series) ended with that fire. The Peshtigo fire is often overlooked--was even overshadowed at the time. But it was more deadly and more devastating than the one in Chicago and caused the most deaths by fire in US history, with estimated deaths of around 1,500 people, possibly as many as 2,500. Survivors reported that the firestorm generated a tornado that threw rail cars and houses into the air. Fire was a very present danger in a society that still heated and cooked with open fire. And unfortunately, the hunters and native tribes regularly left fires burning in the vast forest of Wisconsin. Today only the northern most counties are still forested in Wisconsin but in the 19th century, the state was solid forest. On the day of the Peshtigo Fire, a cold front moved in from the west, bringing strong winds, and the perfect storm hit. It fanned the fires out of control. A firestorm ensued. The Wisconsin's governor's wife, Mrs. Lucius Fairchild, heard of the Chicago Fire first. Her husband was away, but she quickly sent supplies to Chicago and then heard of the disaster in her own state. She then led an effort to send supplies to the devastated area of Sugar Bush and Peshtigo. 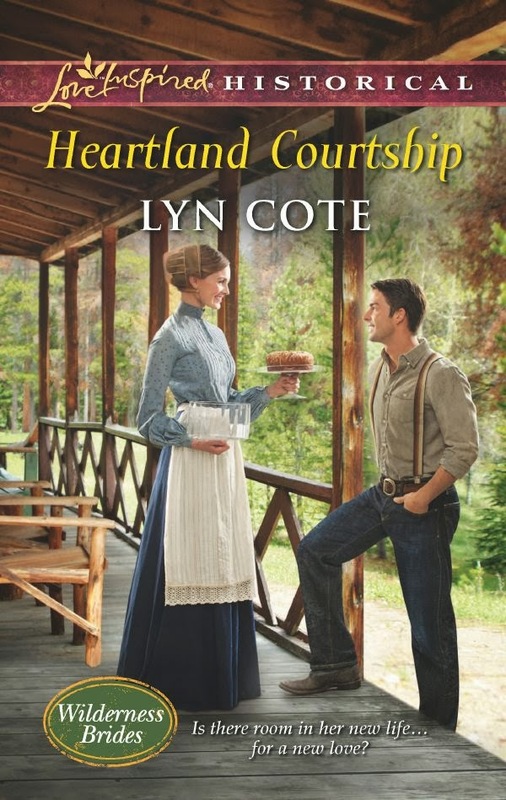 My latest historical Heartland Courtship takes place in Wisconsin in 1871 and the hero must survive the Perfect Storm in order to go back and tell the heroine--she was right! Quaker Rachel Woolsey dreams of having her own bakery and her own homestead. But the odds are stacked against her—until the handsome ex-soldier she nurses back to health offers to help her. Like Rachel, Brennan Merriday is an outsider. But he'll be the temporary ally she needs, and her foolish attraction will fade once he's gone. At first, the only thing Brennan wants to know about Pepin, Wisconsin, is how fast he can leave it. Perhaps in Canada he'll find peace after a bloody war. Yet repaying his debt to the pretty baker offers unexpected solace. She saved him once. Now he longs to rescue dreams of family—for both of them. 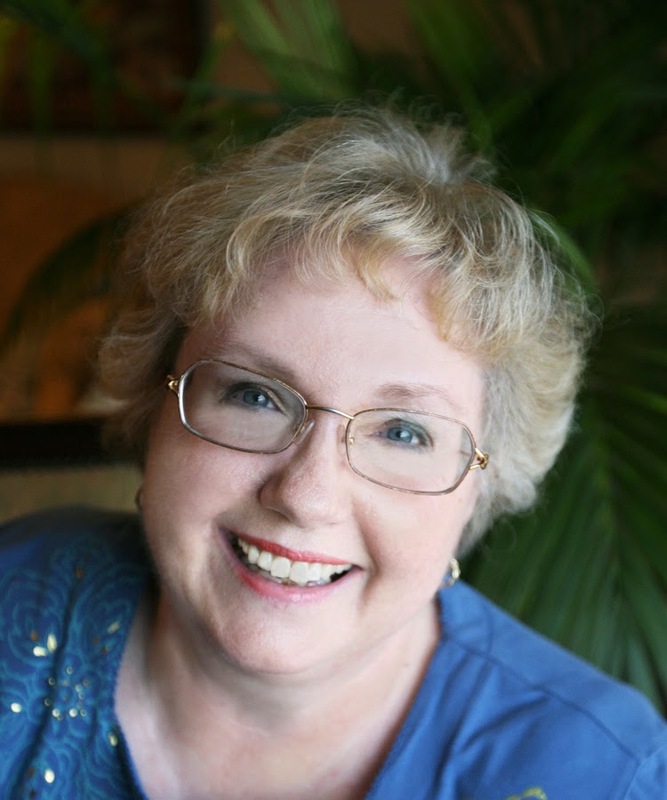 In 1997, Lyn Cote's first book, Never Alone, was chosen for the "new" Love Inspired romance line. Since then, Lyn has had over thirty-five novels published. In 2006 Lyn's book, Chloe, was a finalist for the RITA, and her book Her Patchwork Family was a finalist for the Carol Award in 2010 and Her Healing Ways won in 2011. These are two of the highest awards in the romance genre. Lyn, I had never heard of the Peshtigo Fire. Thank you for sharing this information. I found it very interesting. Melanie, I hadn't either! Chicago is the big city after all! If so, you're my kind of romantic sap! Thanks. Hope you left a review on Amazon for Sophia. She could use a little "love" now and then. Hi Lyn, love the cover of your new book. I knew a little about the Peshtigo fire, but didn't know it caused that many deaths. It's hard for some to imagine life before the communication age. I recently was asked by a young man how my husband and I were able to date without a cell phone. What a hoot! Romance didn't start till cell phones! Great and interesting article! Wow I never heard about the tornado. That is amazing. Love having you on here! Thanks, Debbie. In Chicago that day a gust hit a man and he knocked down a light pole. Now that's momentum! I always used real history whenever possible. It's often wilder than anything I could dream up! Thanks, Chris. Same to you! I can't imagine how hard it must have been to lose everything back in the days without insurance. I'd never heard of this fire before. Thanks for an interesting story! Hi Lyn! 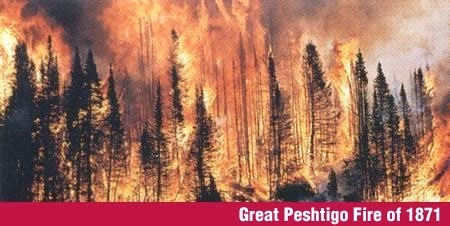 I had never heard of the Peshtigo Fire and cannot even imagine the devastation! I look forward to learning more via the link you provided. Thank you for sharing this overlooked piece of history! There's so much history and so little time!